If these surprise E3 assets are any indication. Of all the ways for a game to be revealed, finding a folder titled 'Bulletstorm Remaster' on an unrelated USB stick is...well, it's quite something isn't it? Multiple outlets are reporting that a USB stick from Microsoft (often used to deliver assets to the press) contained a hidden surprise: a folder full of screenshots seemingly for a Bulletstorm re-release. 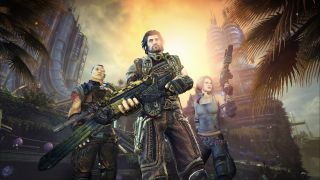 A prettier Bulletstorm not tied to *spit* Games For Windows Live would be a wonderful thing, but obviously we don't know whether this is real, or in active development yet.